Actress Jasmine Guy stars in Atlanta production of "Miss Evers' Boys"
Guy says in current economy "People need to be enriched and entertained"
ATLANTA, Georgia (CNN) -- Actress Jasmine Guy looks for the joy in bad times. 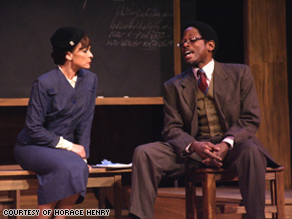 Jasmine Guy and co-star TC Carson in a scene from the play "Miss Evers' Boys." Guy's current stage role in director Kenny Leon's play "Miss Evers' Boys" offers plenty of opportunity for that. "How close is desperation, sadness, loneliness to joy?" Guy said. "I find in this play, it almost made me feel a little split in personality because of the journey, the richness of these lives that these people are leading on stage." The drama, written by David Feldshuh, is about the federal government's infamous Tuskegee Study, in which 399 African-American men with syphilis were deceived by U.S. Public Health Service doctors so the untreated progression of the disease could be studied. "It's probably one of the most embarrassing moments in United States medical history in terms of the way these men were treated," said co-star Eugene Lee, who plays one of the men. "They're simple, naive, illiterate, uneducated tenant farmers who were very trusting, for the most part," Lee said. Guy, who portrays the nurse who cared for some of them, said what she expected to be a gloomy play turned out to offer joy. "I didn't realize there was such texture in the piece until we got the audience there," Guy said. "It's like when you laugh at a funeral," she said. "You're hungry, you go deeper, if you know what I mean, and that makes for more poignant kind of work, a different perspective on the work," Lee said. While the recession does not appear to be affecting ticket sales for "Miss Evers' Boys," Guy worries private corporations will cut financial support for nonprofit art groups, including Leon's True Colors Theatre Company in Atlanta. "I think our hardest thing is to convince the people with the money that we're still very necessary and we can't really afford any less than what we're getting already, especially these struggling theater companies," she said. "It's very important to keep them alive, especially in these middle times." "People need to be enriched and entertained, especially with all that is going on around us," she said. The production runs through March 21 at Atlanta's Southwest Arts Center.